This week, I wrote a secret prayer for a woman that I don’t know . I rolled it up and laid it sweetly into an a tiny altar that I had made for her, surrounded by star shaped sparkles and images of blooms budding. You deserve a revision – then another. Delicious, unhurried mornings. Tender, toe-curling romance. The slow luxury of knowing that there is no race, no rush – simply you being exactly who you are. You deserve to tend to your sweet body in a way that honors and respect your wild, loving spirit. You deserve your own compassion. I have been feeling the push to rush. The push to make things happen, putting one foot in front of the other in spite of myself. I have been feeling the urge to prove myself. This is old energy for me. The striving, the pushing, the persistent urging of the fear of not being enough, not doing enough, and not having enough. I didn’t sleep through the night a single night in January. Instead, lulled by the constancy of my excitement and churning wheels of what’s next what’s next what’s next, I lay in bed, eyes open, and thought about my life and my business. I thought about who I want to be, what I want to do – next. But, because I was awake and vibrating with idea upon idea – I had no ability to implement any of my own beautiful visions. I would wake up, circles beneath my eyes, fragile and yearning to return to the quiet web of my dream world. The push and pull of ideas without action. The truth is, we are only as good as the version of ourselves that we bring to the world. When we are living off of coffee and sugar, wide-eyed and yawn-filled-moments, we are not bringing the best version of ourselves to the table. And, yet, we back ourselves into this corner again and again, believing in production at all costs. How often do we push ourselves, believing that we are getting somewhere? How often do we tell ourselves that we must stay up past our bed time, rush through our hungers, or push our the desire of our bodies to the far, dark corners of our minds? We can not live in spite of ourselves. We cannot force ourselves to show up and perform without leading directly to a state of burnout. 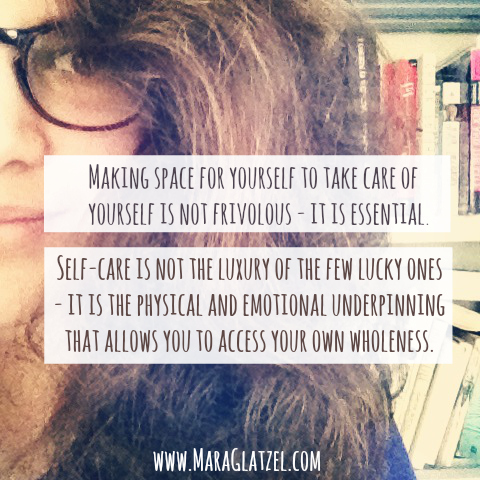 We must be tender stewards of our bodies, moving ourselves with purpose and pleasure as we tend to our own needs. We do ourselves a disservice when we tell ourselves that we will start taking care of ourselves tomorrow, because today is the day for action. Action without the capacity to participate in our own lives is useless. Your life force requires rest. It requires hydration, movement of your limbs, the steady uncoil of pent up emotion. It requires connection, closeness, and intimacy. A joyful, satisfying life demands all of you – including the parts that you have quartered away and hidden. The inconvenient parts. The non-productive parts. The child parts. The sensual, day dreaming parts. The parts that have you pausing to feel the softness of fabric or the quiet of five deep breaths in the morning. Tender sustainability is the way that you support yourself during your daily life, so that you can keep on showing up in the way that you want to. It is turning your sweetness, the full-breadth of your ample care-taking abilities, in on yourself and allowing yourself to receive your own love, your own compassion. It is about plugging into your life in a way that allows all of your parts to cozy up and find a safe spot to perch. You deserve the slow luxury of knowing that there is no race, no rush – simply you being exactly who you are. I left campus this week for home when I realized I couldn’t take care of my depression and finish the school week at the same time. I have been dealing with shame, and anxiety, and so much sadness. This piece was full of permission in what I need. It made me cry. Thank you. I’ve got CFS, and along with pacing how much I do, the hardest thing is taking time to care for myself. Thank you for this reminder. I think the all-action-no-rest ethos is one of the most damaging (not to mention counter-productive) myths in our culture. It not only impacts the people who are running themselves ragged, it also impacts the people they come in contact with because with no opportunity to rejuvenate we inevitably show up just a bit weary and ragged around the edges. I always think of the analogy of fields needing to lie fallow now and then in order for them to keep yielding abundant crops. Without that, the soil nutrients just get leeched out and the soil’s richness gets depleted. It’s no different for us.